With the weather getting warmer and the sun starting to shine it gets me in the mood for summer. I crave all things citrus this time of year and blood oranges are one of my favorites. This is a perfect winter margarita because blood oranges are now in season but won’t be around for long so go get yours quick! Since I am not a fan of overly sweet drinks, I love using fresh squeezed juice. You will be throwing your sweet and sour mix out the window! 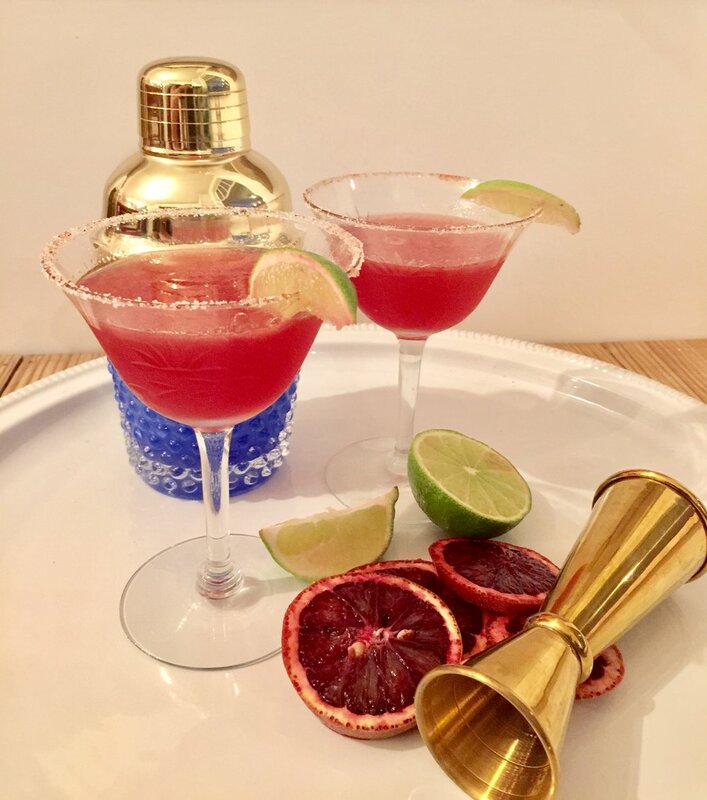 Blood oranges have a fun vibrant color and a wonderfully sweet & tangy flavor which creates a unique, refreshing and oh so good marg. One sip & you’ll feel like your wastin’ away again in Margaritaville. Pair it with my Lentil Tacos for the perfect Taco Tuesday meal! 2 oz Tequila, a nice and smooth tequila that is, get the good stuff- you wont regret it! 1 oz Triple Sec, Cointreau, or Grand Marnier - don't skimp here either. The cheaper you get the more sugary/syrupy it will be. On a small plate mix the sugar, salt & paprika. Wet the rim of 2 stemmed cocktail or margarita glasses by running a lime wedge along the rim. Dip/roll the rim into the sugar/salt/paprika mixture. This will add a little pizzaz to the drink & presentation. Next, squeeze the juice from the blood orange and 1/2 of the lime into a cocktail shaker. (I love using my citrus press, less mess & ensures you get all of the juice!) Add in the tequila & triple sec and top with ice. Now, shake it like a salt shaker! Strain into your 2 glasses & garnish with a thin slice of lime.